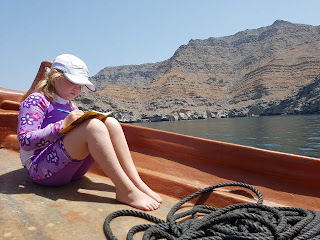 The reason we came to Khasab, Oman was to see the fjords of Musandam. During our 6 hour cruise through the majestic landscape, we saw several pods of dolphins, the historic Telegraph Island, and lots more! Background on area, lengths, depths. We learned yesterday about how the plates were formed. We were on the bus at 9:12 in the morning. Since we were the first ones to board, our kids wanted to sit at the back of the bus. Because, they explained, "that's where all the 'travel-makers' sit". We arrived at the marina and boarded our boat by 9:30. We had to cross over / pass thru several other boats moored along side each other to get to ours. I stopped along the way at the second or third boat for a set of loaner fins because mine are just too big to pack. Our dhow has that familiar sea scent that most divers would recognize: a faint rubber odor with just a hint of diesel fuel and mixed with a slightly salty and sour smell. Which is what one should expect in this particular setting. 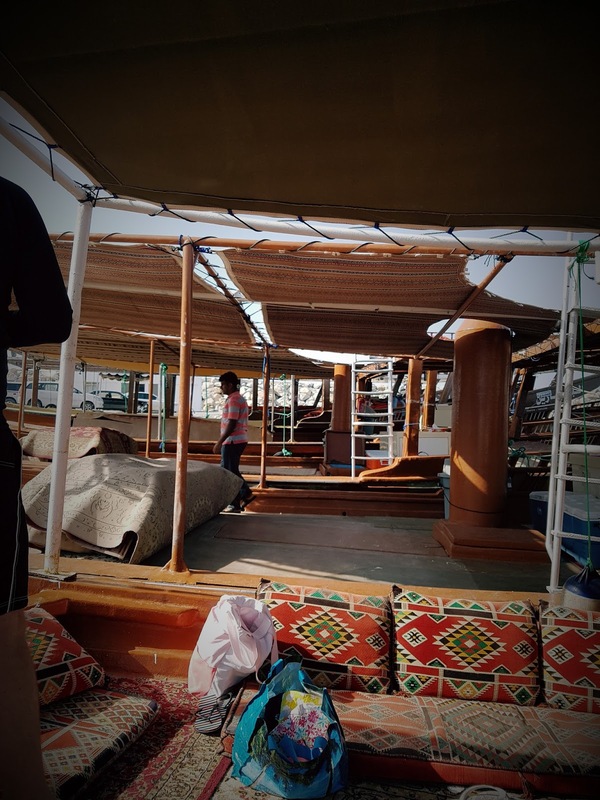 Our dhow is covered, with a buffet of fruit snacks and hot tea & coffee as well as some cold water and cola. 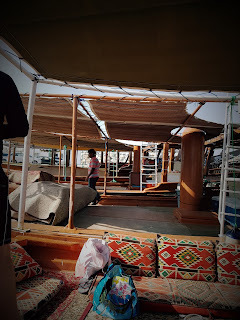 Some of the other dhows have upper decks for sunbathing, but ours didn't. Which is just as well, as today is very sunny so the shaded seating is at a premium. And since the boat changes course occasionally, the shaded side of the boat changes too. We entered the first fjord (which is the longest one at over 13km) shortly after leaving the port. On our way to a fishing village, we made contact with a pod of humpback dolphins. They were surfing on our wake, right next to the dhow. After motoring about halfway into the fjord, we reached Telegraph island and hopped out of the dhow to snorkel a bit alongside several other dhows. However, just before getting in the water, I had to briefly stop assembling my gear and climb up on the gunwale that I was straddling between two dhows in order to prevent a couple of people who were climbing a ladder out of the water from being crushed between the boats as they drifted together. Oddly, that's not the first time I've had to do that exact same thing. You can see where the dhows anchor together. There are lots and lots of sea urchins in the shallow water around Telegraph Island. It's a little unnerving, so you just have to resist all urges to stand up so that you won't step on them. There were also much larger fish than I expected to see in these shallows. We swam back to the boat and jumped overboard several times. We had lunch on the boat beside Telegraph Island. It was a rather tasty green curry chicken with basmati rice, prepared by our captain and crew who are from Bangladesh. Note: we were told on the way out of port to only use the bathroom on the stern when the boat was moving. During lunch, we discovered why: a woman in the next boat over used it, and "stuff" dumped out of the toilet cabin floor and nearly landed on top of someone in the water at the back of the boat. Ew. After lunch, we pulled into a cove and saw two sharks, a large sting ray, and maybe even a spotted ray from the boat. Swim site number two had lots of fish, as the crew fed them from the deck. We hopped into the water and less than 5 minutes later, we found jellyfish the hard way. Seventy-five percent of our family and several others on our boat made contact with the invisible menace. Even though we had our rash guards on, the exposed skin still got needled. Our little one did not like that at all, so that particular outing ended in tears. But about 5 minutes later, all ways well. And she now tells everyone that she was stung by a jellyfish. I think we were on our way back to port just after 2:15 when we came across some more dolphins who wanted to play with us, so we got more photos of that. We were back on dry land at 3:45 pm. We then returned to hotel, played in the pool, had dinner, then went to sleep. So, yeah, today was a pretty good day.